A "virtually untreatable" form of TB has emerged, according to the World Health Organization (WHO). Extreme drug resistant TB (XDR TB) has been seen worldwide, including in the US, Eastern Europe and Africa, although Western Europe has had no cases. Dr Paul Nunn, from the WHO, said a failure to correctly implement treatment strategies was to blame. TB experts have convened in Johannesburg, South Africa, to discuss how to address the problem. TB presently causes about 1.7 million deaths a year worldwide, but researchers are worried about the emergence of strains that are resistant to drugs. Drug resistance is caused by poor TB control, through taking the wrong types of drugs for the incorrect duration. Multi-drug resistant TB (MDR TB), which describes strains of TB that are resistant to at least two of the main first-line TB drugs, is already a growing concern. Globally, the WHO estimates there are about 425,000 cases of MDR TB a year, mostly occurring in the former Soviet Union, China and India. Treatment requires the use of second-line drugs, which are more toxic, take longer to work and costly. 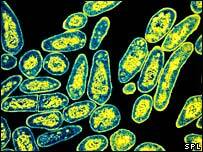 But now, according to researchers, an even more deadly form of the bacteria has emerged. XDR TB is defined as strains that are not only resistant to the front-line drugs, but also three or more of the six classes of second-line drugs. This, according to Dr Paul Nunn, coordinator of the WHO team at the Stop TB department, makes it virtually untreatable. A recent survey of 18,000 TB samples by the US-based Centers for Disease Control and the WHO between November 2004 and November 2005 found 20% of them were multi-drug resistant and a further 2% were extreme drug resistant. Further detailed analysis of several countries found the prevalence was even higher. In the US, 4% of all MDR TB cases met the criteria for XDR TB; in South Korea, the figure was 15%. In Latvia, and according to Dr Nunn other areas of the Baltics and the former Soviet Union, 19% of all multi-drug resistant cases were extreme drug resistant too. Dr Nunn said XDR TB was present across several strains, but added it was not yet clear how transmissible it was or whether it was limited to isolated pockets. But he warned HIV positive people were at particular risk. He highlighted a study recently presented at the International Meeting for Aids, held in Toronto. In Kwazulu-Natal, in South Africa, 53 patients were found with XDR TB. Of these, 52 died within 25 days, and 44 of the 53 had been tested for HIV and were all found to be HIV positive. He said XDR TB could have a bigger impact on developing nations, including Africa, because of the prevalence of HIV. Dr Dunn said: "This is very worrying, especially when mixed with HIV. "We need to make sure we do the basics properly, in other words, ensuring, and where necessary, supervising that the patient takes every pill for the course of the treatment. "If you do that, then the rate of development of resistance drops dramatically, even in the context of HIV." He added that it was key that new drugs were developed in future. He said work was underway looking at new drugs, including research into TB vaccines. The meeting in South Africa will discuss the recent findings and how to curb the growing problem. Paul Sommerfeld of TB Alert, said: "XDR TB is very serious - we are potentially getting close to a bacteria that we have no tools, no weapons against. "What this means for the people in southern Africa, who are now becoming susceptible to this where it is appearing, is a likely death sentence. "For the world as a whole it is potentially extremely worrying that this kind of resistance is appearing. This is something that I am sure the WHO will be taking very seriously."